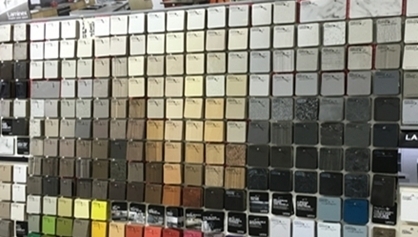 We may all be familiar with the resilient features of Laminate; with its reasonably high resistance to wear, heat and staining, this type of material is available today in a huge selection of Colours, Patterns, Woodgrains which are made in a variety of surface finishes including; Matte, Textured and Gloss finishes. Laminate Doors and panels are only Two Dimensional and therefore have limitations to door design; these having a plain flat face and being finished off with square edges. Edges are mainly finished with a matching edge strip material (but these can be contrasting) ranging from an inconspicuous 0.5 mm melamine strip, or a 0.5 - 1.0 mm printed PVC Edge Strip. 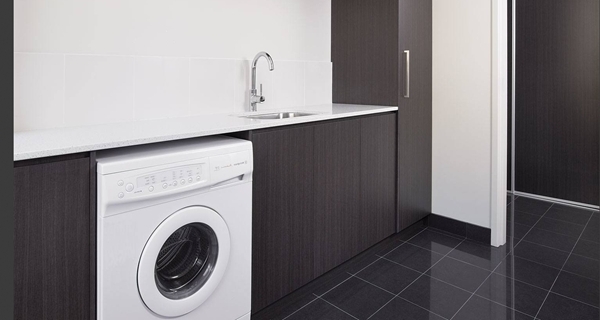 Most Australian Laminate Board manufacturers have however now moved toward only making matching edge strip material in 1 mm and 2 mm lower density printed strip in ABS plastic material where the joint line of these ABS Strips are more visible. All these edging methods produce a Square Edge profile finish around the whole door with a visible joint line which is also susceptible to moisture penetration. This Factory laminated board can be used to make Doors, End Panels, for Open Shelving and Base Kickers. 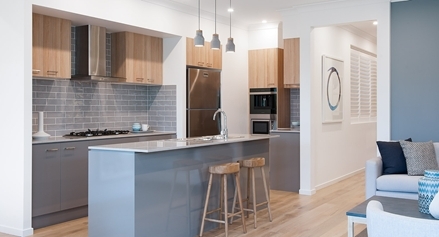 These boards are made using a thin hard wearing clear melamine resin coating which overlays a photographic image of either a colour, or a Woodgrain or a pattern and these are bonded to a core panel on both sides; being of either a Particleboard, an MDF (Medium Density Fiberboard) or a HDF (High Density Fiberboard) core board. 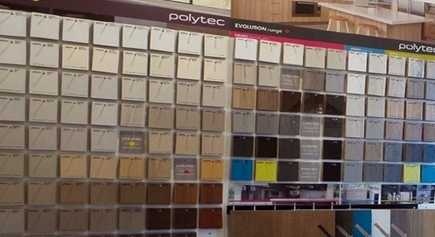 There are three types of Laminated board on the market at the moment; one type is made from a Melamine Resin coating and the second type uses an Acrylic Coating where the Melamine is available in various textured and matt finishes, as well as a Silk Gloss finish, whereas the Acrylic is mainly a Gloss Material with some manufacturers also making a Matte finish but in a limited colour range. The Acrylic Board made into doors can be Laser edge striped; where the advantage here is a less visible joint line. The third type of Laminate Board on the market is a Melamine Board which has an additional clear satin Two-Pack coating sprayed over the Melamine board; where this produces a Satin finish that reduces finger prints. The Two-Pack here is applied to the full sheet during manufacture of the board before it is cut into doors and so still needs Edge strips to be applied. Buyers should be aware that this product does not have the same protective properties of "Two-Pack" doors and so should take care not to confuse this type of Laminate Melamine for a "Two-Pack Kitchen". While the lower cost of using Laminate Doors has an advantage, there are however three downsides to all these Laminate Board materials, where the first is that you can't have three dimensional laminate decorative detail to the edges or the face of these panels. The second is that these edge strips (especially the thicker ABS) have a clearly visible edge and a Joint line around each panel and the third downside to this type of material is that the join between the Laminate board and the Edge strip is vulnerable to water penetration if not dried immediately and so Laminate Doors are susceptible to water damage over time; especially around dishwashers, around Kitchen, Laundry and Vanity sinks, around kettles as well as general wet areas like the Laundry, Bathrooms or the Outdoors. 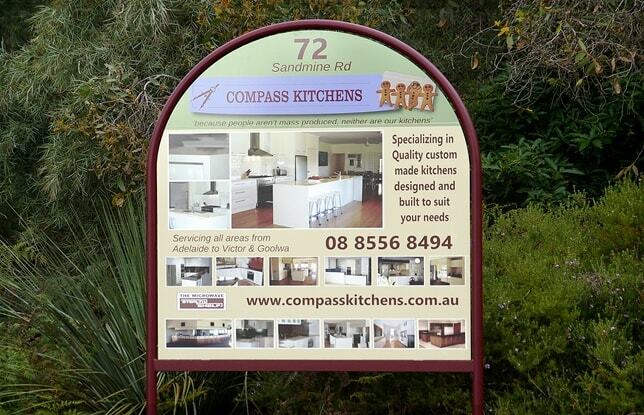 Here at Compass Kitchens we only use Laminate face boards for Doors and Panels that have a Medium Density Fiberboard core (MDF) or a High Density Fiberboard Core (HDF) and do not use the cheaper chipboard / Particleboard core Laminate panels even though these cheeper boards are available in all the same colours and patterns. 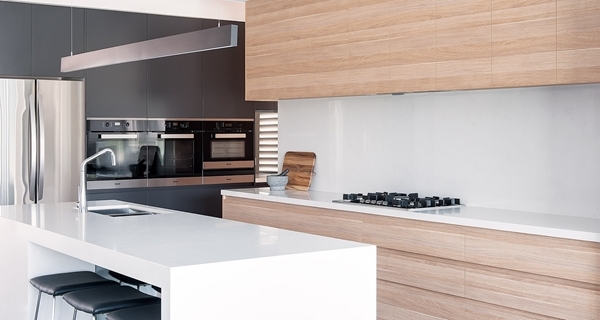 We also only ever use the HMR MDF and HMR HDF type of board that is Highly Moisture Resistant (HMR), whereby providing even more protection and a longer-life span; providing you assured optimum performance when choosing to use face Laminate Board materials. New to the market is a Laminate Door product called Avellino, which is made to custom sizes by Polytec who use some of their Woodgrain Laminate Board range. This Avellino Laminate Door is made up of Two Vertical Grain Side Rails and a Centre Panel with Horizontal Grain that is then Edge stripped all around. 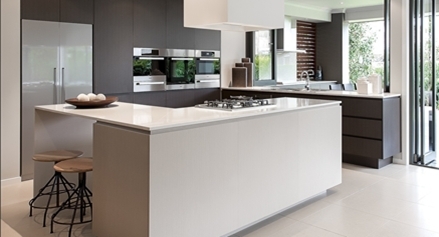 The Avellino door is a stylish new alternative to having a plain square edge Laminate Door or that of the plain flat Contour Finedge Laminate Door panels and lends itself well when used in contemporary Scandinavian Style Kitchens.